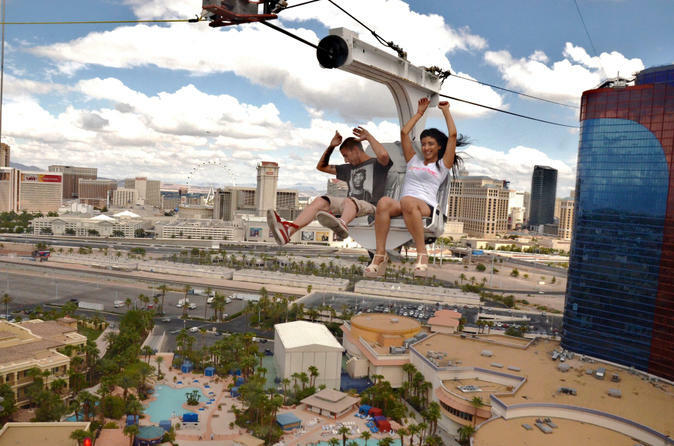 If gambling has lost its thrill, whiz above Las Vegas on the motorized VooDoo Zip Line at the Rio Hotel and Casino. Take off from Rio’s 50-floor Masquerade Tower and jet through the warm Sin City air in a comfy two-seat chair. One minute and 10 seconds later, you’ll be atop the 20-story Ipanema Tower, ready for the second part of your round-trip journey back to the Masquerade Tower. The VooDoo Zip Line adventure begins atop the 50-story Masquerade Tower of the Rio All-Suite Hotel and Casino. Instead of operating with a harness, which is standard for most ziplines, the VooDoo version is equipped with a comfortable two-seater chair on a wire, giving you the choice to ride solo or with a friend. Just off the Strip, take in views of the city and the high-rise hotels while cascading 33 mph (53 kph) and 800 feet (250 meters) through the dry Las Vegas air — one minute and 10 seconds in total — to the 20-story Ipanema tower. Think you’re done? Think again. The line goes back to the Masquerade Tower, this time going backwards at about 25 mph (40 kph). Afterward, treat yourself to a meal or a beverage at Rio Steakhouse and toast to your flight through the Sin City sky! Please note: There is no age minimum however all riders must be at least 48" (122cm) to ride. Weight restrictions apply, please see Additional Info for more details. After 7:30pm, all riders must be 21 years and older.